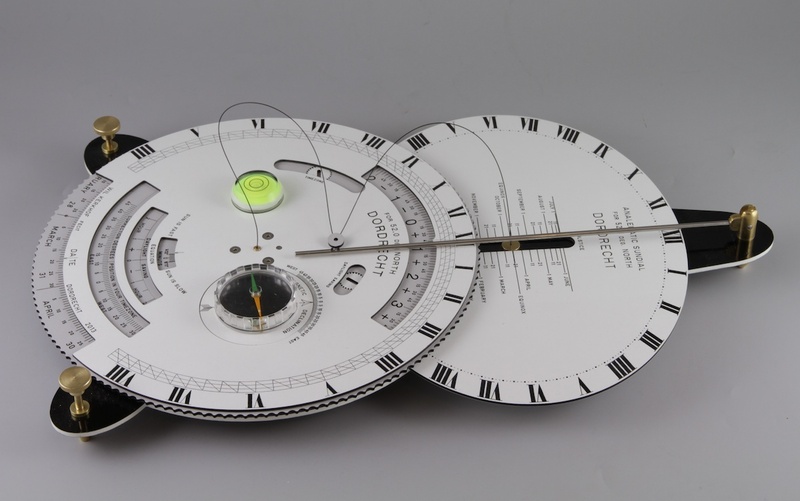 #2013 Animation Horizontal and Analemmatic sundial for 30-60 degrees of latitude. 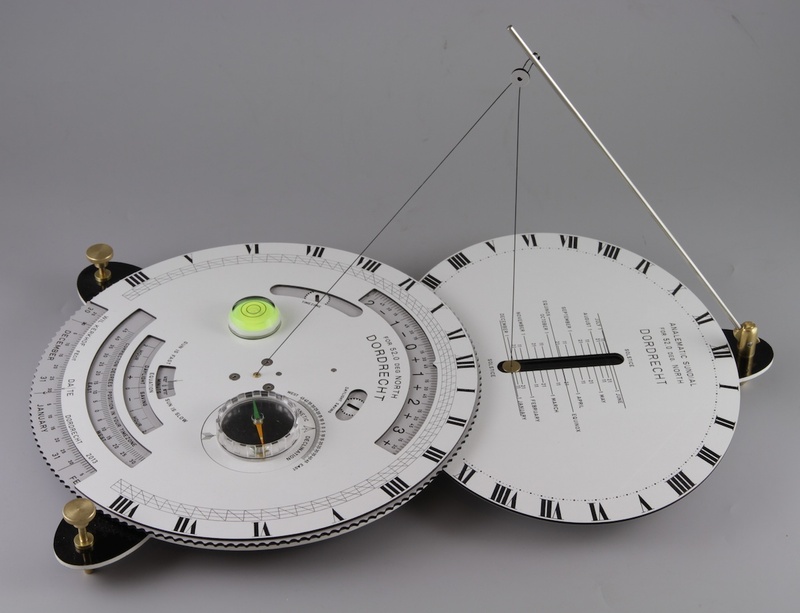 Animation of the changing appearance of a Horizontal and Analemmatic sundial for latitudes of 30 degrees North to 60 degrees north. Click on pictures for large view Individually made on demand for your geographic latitude. 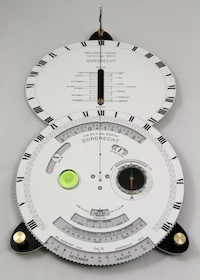 This dial can be ordered custom made for your latitude. 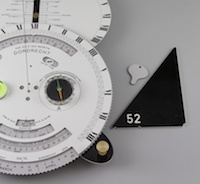 The dial example here has a latitude of 52.0°. To see how both dials are affected by a change of latitude look at the animation below. 1. Adjust the relative position in your timezone by turning the wheel in Timezone aperture. For example: My co-ordinates are 4.6° east and 52.0° North. My timezone is CET and is GMT+1. A timezone is 15° wide (24 timezones --> 24 x 15° = 360°). 2. Adjust the Daylight-Saving by turning the wheel in Daylight-Saving aperture. 3. 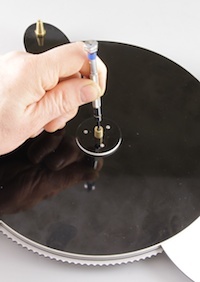 Turn the outer ring (Date-Ring) on the current date. 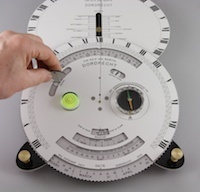 By turning the Date-Ring, 2 further adjustments are done automaticly, the equation correction and the analemmatic dial (upper dial) moves to the right position. 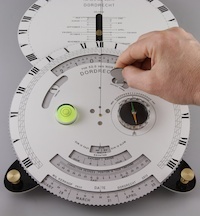 The vertical gnomon corresponds always with the date in the Date-Ring. The equation correction is automaticly added or subtracted in the final timezone calculation. 4. 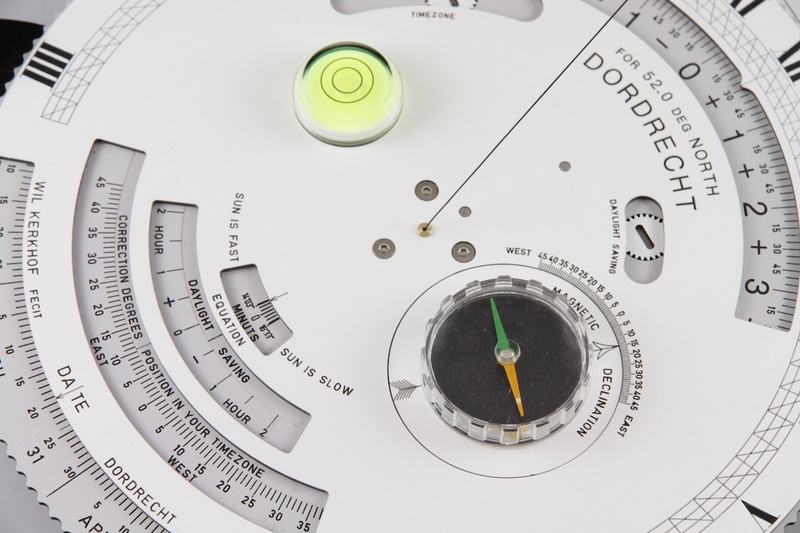 Turn the compass until the arrow corresponds to your local Magnetic Declination. (when the sun shines, the dial is automaticly in North position when the shadows of both gnomons give the same time. Only the date must be set and the the dial must be levelled horizontal. This way arround, one can also find the Magnetic North and your local Magnetic Declination. 4: Dimensions: length = 42cm (16.5"), wide 25.5cm (10"), height: depends on the latitude. 5: Construction: The dial has 5 interactive layers and is made from 2 and 3 mm hard Resopal, brass and stainless steel. The Resopal is very hard and inflexible. It has 2 levelling srews and 2 adjustable gnomons. The gnomons are fixed to an arm that keeps tension on the 2 gnomon strings. The arm can be lowered down for fitting the box. The dialplates are drawn in a selfwritten computer program and then CNC-engraved and cut. 6: Gnomon adjustments: The 2 gnomons can be individualy adjusted. 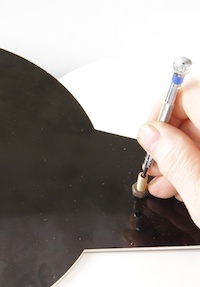 The length is altered by turning the srew with a small srewdriver in the bottom. Remember that every change on one gnomon does influence the angle of the other. On delivery the gnomons are correcly adjusted and do not need further attention. 8: Included: The dial is delivered in a wooden box (44 x 27 x 5 cm) (17.3" x 10.6" x 2"), Resopal gnomon mesurement tool, Resopal adjustment srewdriver. 10: Delivery: Please contact for delivery time and conditions.